"Smart homeowners are our best customers !" As is the case with almost all homes, the steel poles in the basement are typically found where the homeowners wish to install home theatres and pool tables. 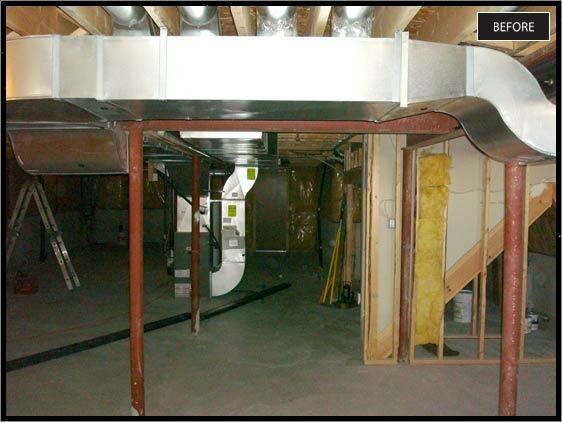 The ventilation ducting presented a daunting challenge for anyone contemplating how to finish their basement. The route that the ducting took, under the steel beams and around the basement, was quite typical of how most new construction is done. By reinforcing the existing I-beams to accommodate the longer span, steel poles can be removed thereby opening up longer and wider unobstructed spaces. 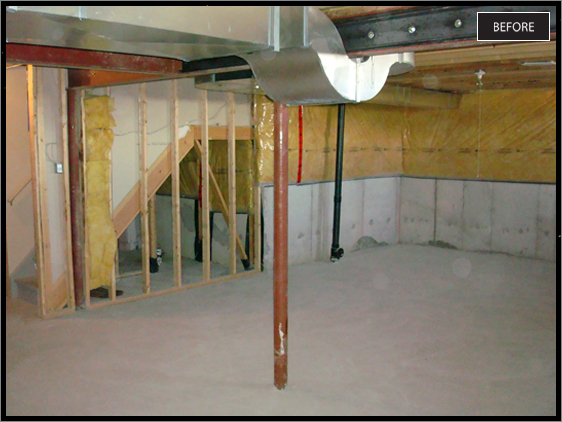 Under-beam duct humps are re-routed over the beam and, whenever possible, other ducting is moved closer to the beams or walls to maximize the full-height areas of the basement. During the course of all ducting proceedures, we also address the supply air pipes feeding those problem second floor rooms, usually resulting in more than double the air flow. We then seal all the leaks in both the supply and return air systems so that the house "breathes" properly and efficiently. Here are some additional views of the same area (above) from different perspectives. The Before 2 & After 2 pictures show the position of the second pole that was removed from a traffic area near the bottom of the stairs. The Before & After 5 & 6 pictures are just a sample of the types of hanging pipes that we deal with in order to eliminate the need to build additional bulkheads (ceiling boxes) all over the place!